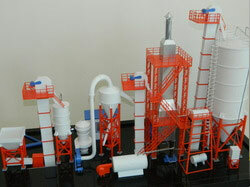 We are leading manufactur, supplier ,exporter of Gypsum Powder Production Line Technology. 1. Brief Introduction of Gypsum Powder The natural gypsum powder includes anhydrous gypsum and CaS04.2H2O, if you want to commercialize the gypsum powder, you should adopt the CaS04.2H2O, after removing part of water by heating, it will become CaS04.1/2 H20. CaS04.1/2 H20 is the final product which you can use it to produce gypsum board other gypsum product. After calcining, CaSO4.1/2H2O is widely used in paper faced gypsum board and gypsum block and painting gypsum powder and model. Natural gypsum generally includes dehydrate gypsum and anhydrous gypsum. In order to get the valuable materials, generally, we get semi-hydrated gypsum through heating the dehydrate gypsum. The calcined semi-hydrated gypsum can widely be used for plasterboard, decoration board, gypsum block, stucco gypsum, and molding gypsum etc Content of CaSO4·2H2O in gypsum mine > 80%. Because we realize fluidization, the furnace does not need moving component, and the structure of the furnace becomes simple. Not only it is easy to manufacture, but also we do not need maintenance after put into operation. Because we use low-temperature source, so the furnace does not have any risk of being burnt in any condition, also the equipment will have a long life. Compact equipment, low area coverage The boiling equipment is vertical-arranged equipment, and the dust remover on the top of the furnace, make a complete body with the furnace. So the equipment is compact and low area coverage.